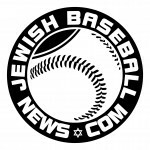 What says “Happy Chanukah!” or “Congratulations on completing your court-ordered community service!” better than an oversized bumper sticker featuring the new Jewish Baseball News logo? What’s that? “Nothing,” you say? You couldn’t be more right. Whether the target of your generosity is a Little League bench-warmer or a middle-manager quietly dying on the inside, our bumper stickers contain an estimated 14.3 metric tons o’ love per unit, the maximum allowed under interstate cargo law. To order these sure-fire collector’s items, just click the “Add to Cart” buttons above and purchase as many as your children’s inheritance will allow. Shipping is free, though sales tax will be applied as required in certain Socialist locales.